A writer friend recently asked a group of writers for ideas on redoing her office, and the conversation reminded me of this piece I wrote years ago, originally published in Byline, in March 2006. (A previous version also appeared in First Draft, the newsletter of the Guppies chapter of Sisters in Crime.) The principles apply to spaces of all kinds—readers of Death al Dente and Crime Rib will recognize the language and ideas from Liz’s re-do of the Merc’s courtyard. A writer’s office should be a haven, a sanctuary. A safe place to explore unknown realms of the heart and mind. A nest, a birthing place. An efficient model of production where computers and printers spit out polished manuscripts. Instead, all too often, it’s a jumble of books, thoughts, dreams, and paper. Who among us hasn’t scribbled a terrific idea on a scrap of paper, only to bury it in a towering pile? Feng shui (fung SHWAY), the Chinese Art of Placement, can help writers harmonize the natural energy of our work space to increase comfort and prosperity, and help us meet our goals. Literally, feng shui means “wind and water” – the intersection of the seen and unseen. In Chinese philosophy, qi (chēē) – the natural vital force of a body or space – moves in predictable patterns. In the body, energy flows along pathways called meridians; acupuncture and herbs are used to remove obstacles and restore harmony, the optimal state. In a physical space, furniture and objects are moved or changed, elements added, and colors changed to correct imbalances. Specific energies may be enhanced to improve the function of, say, the liver or the living room, the kidneys or creativity. More than another design idea, feng shui is a practice that helps us live in better harmony with ourselves, with others, and with the physical world. Feng shui is built on intention: making a change with a desired outcome in mind. With practice, you can feel the energy in your work and living spaces, and shift its flow. An excellent introduction is The Western Guide to Feng Shui: Creating Balance, Harmony, and Prosperity in Your Environment, by Terah Kathryn Collins (Hay House, 1996). Some concepts seem intuitive – that is, our bodies know them – even to a westerner. One example is the placement of your desk. With your back to the door, you may have trouble concentrating; once you sink into a project, you may be easily startled. Move your desk – give any change at least two weeks – and notice how it feels. The flow of energy in a space can be visualized through the Bagua (BA-gwah) map, which originated with the trigrams of the I Ching. Oriented with the entrance, it can be applied to a house or apartment, business, room, or plot of land. The entry will be in knowledge and self-development (as mine is – see drawing), career, or travel and helpful people. 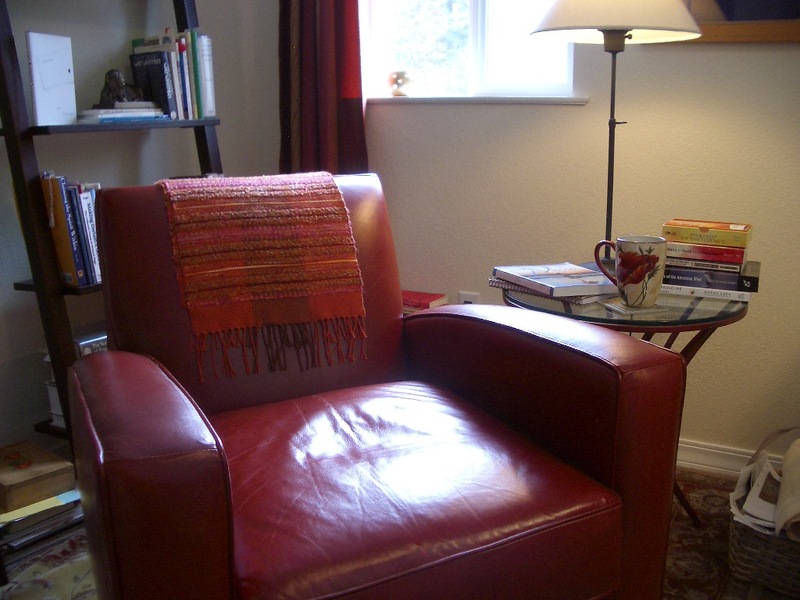 First, walk into your home – do this physically or by visualization – and sense the energy. What areas feel strong and powerful? Do others feel weak or blank? Then, apply the Bagua to your home to determine which area holds your office. All locations are equally beneficial – or auspicious, as the Chinese say – but each has its own benefits. For example, my husband’s office is in the wealth and prosperity area of our home (back left, from the front door); his business is booming. Mine occupies knowledge and self-development (front left, second floor); in this home, I have explored many personal issues deeply. Next, apply the Bagua to your office. 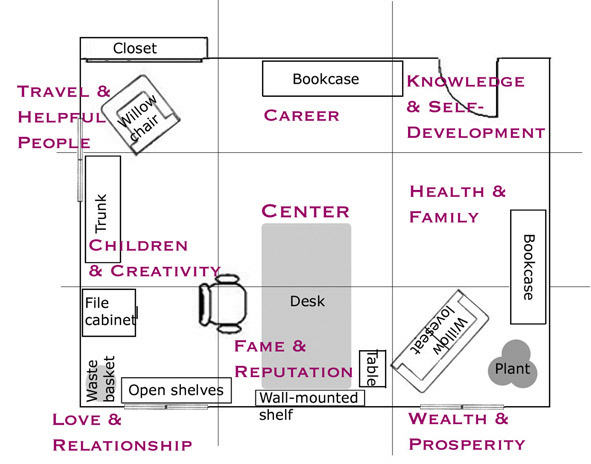 (If your office occupies part of a room with other uses, what energy is identified with your section of the room?) Draw the floor plan and sketch in the major furnishings. Make the feng shui grid – like tic tac toe — and label the areas. Decide what to emphasize. If you’re starting a new project, spruce up creativity or knowledge. If you’re writing a nonfiction proposal on a health topic, work on the health area. If you’re starting the agent hunt, focus on helpful people. If your manuscript is circulating, look at helpful people, career, and prosperity. For example, in my office, I moved a vibrant print of a horse to the fame location (also the home’s career aspect). Animals and the color red accentuate fame and reputation, while the dark blue mat reflects the water element present in career. On a shelf beneath it, I placed a red candle, a healthy plant, a stack of books on writing and novels I admire, and a framed motto that expresses my intention. In health and family, I hung a treasured photograph of my great-grandmother with her mother and sisters, above a bookcase topped with fresh flowers and a wire sculpture of a yoga pose. I relocated an abundant plant to the wealth corner, adjusting a willow love seat so I could sit where health meets wealth. Within days, an editor called to assign a story I’d pitched months earlier and suggest a second article. A low-paying assignment changed focus, with no additional work and considerably more money. A project I’d struggled with came together easily. – Feng shui practitioners advise not working in a bedroom. Bedrooms should feel calm; offices require more active energy. If that’s unavoidable, consider using a screen or curtain, or a desk armoire. Cover your computer or close a laptop when not in use. Keep the space spotless. 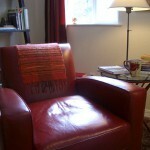 – Does the furniture placement flow, or does it bother you? I dislike the feel of a tall bookcase behind me. Experiment with your own preferences. – Make sure you can move freely throughout the space. If furniture or stacks of books and papers obstruct your physical movement, they may also obstruct your creative flow. – Organize your desk top like a room, with your chair the entrance. If your desk is too small to hold many personal touches, place a symbolic item in the Bagua area corresponding to an issue in your work (e.g., reputation, creativity, prosperity). Tuck written affirmations under your computer monitor or phone. Choose your coffee mug and coaster as personal symbols and place them in an appropriate spot. Even your mouse pad could represent a career wish. – Keep your desk top as clean as possible so you can actually work there. If you need a table, shelves, or a credenza to hold additional work, make the investment. – If you find yourself toting your laptop or notepad to other rooms, consider what area of the house holds your office and what area you’re migrating to. 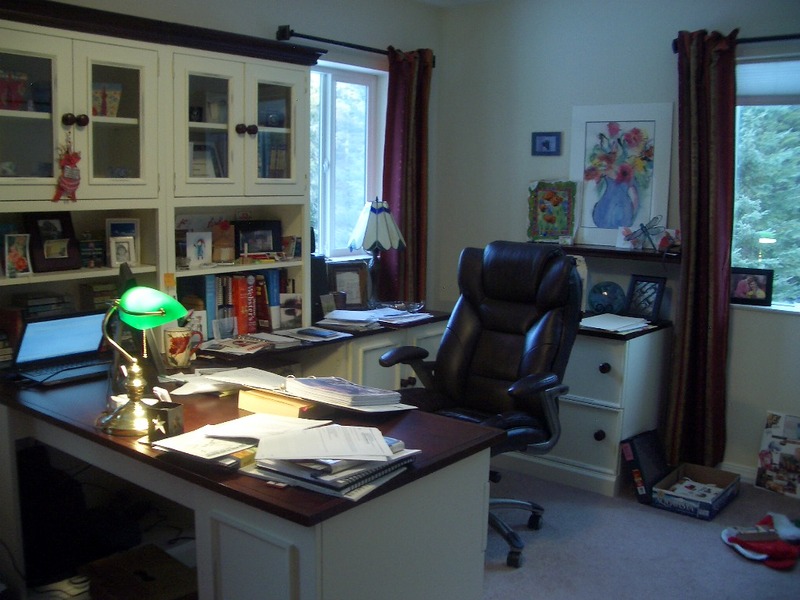 Can you rearrange your office, or switch rooms, to maximize writing energy? Artists are by nature not minimalists. We collect ideas and images, sometimes in our heads, often on bulletin boards, on shelves, and in piles. In Chinese medicine, illness or injury occurs when qi becomes stagnant in a specific part of the body. In a space, energy stops flowing when the space is cluttered or incomplete (e.g., when a space is not a complete rectangle). We all feel better after cleaning a messy room or drawer. Even clutter hidden behind closet doors affects us. But that doesn’t mean we should all live in streamlined fashion. Ask the key questions: Can you find things? Do your possessions serve you? Do you enjoy your space? 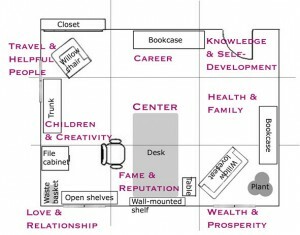 In Clear Your Clutter with Feng Shui (Broadway Books, 1999), Karen Kingston describes typical sources of clutter and gives practical suggestions to improve specific aspects of your life with focused clutter-clearing. (If your clutter stems from too many books, get hers from the library!) Kingston says when we no longer listen to a particular CD or wear a certain color, it’s often because we have incorporated the “vital essence” of the music or shirt that once nourished us. We hang on to things because of past associations; they remind us of an important moment or experience. But we’ve had the moment; we no longer need the object. That insight’s given me a new ability to release objects and help them find someone who needs them. – Toss as much paper as possible. Aim to deal with mail once – pay the bill, toss the credit card offer, recycle the catalog the day it arrives. – Tracking stray notes requires time and dissipates your energy. Start a notebook for ideas. Plan when you’ll work on a project and write it in your calendar; move incomplete items forward – the point is to focus your energy, not to produce guilt over undone tasks. – Recycle unused items. Repair what doesn’t work. Find a new home – outside yours – for extra computers or stereo components. – Clean out old manuscripts. You probably only need the final hard copy, one backup at home, and one backup off site. – Keep writing guides that still speak to you; donate the rest to a library or book sale. – Writing magazines and newsletters multiply clutter monthly. If you want to keep an article, tear it out and file it. But don’t postpone filing until you have time to reread your magazines and decide what to keep! If an article doesn’t scream “clip me” on first reading, you don’t need it. Trust that necessary information will come to you – you’ll see another article on point or hear a bit of critical advice at just the right time. – Clean out your computer files. I delete one unused “favorite” for every new one. Like meditation, yoga, and t’ai chi, feng shui is both a spiritual and a physical practice. You can delve into at as deeply as you choose and benefit at every level. For writers, feng shui offers simple tools to organize our spaces and bring ourselves – and our work – into greater harmony with the natural flow of energy. And that’s when our most creative selves emerge. 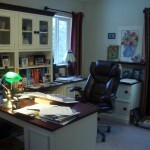 This entry was posted in The Writing Life and tagged feng shui for a writer's office by Leslie Budewitz. Bookmark the permalink.